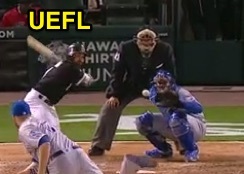 HP Umpire Hunter Wendelstedt ejected White Sox CF Adam Eaton for arguing a strike three call in the bottom of the 9th inning of the Royals-White Sox game. With two out and one on, Eaton took a 2-2 fastball from Royals pitcher Wade Davis for a called third strike. Replays indicate the pitch was located over the outer half of home plate and belt high (px -.66, pz 2.724) and that all preceding pitches during the at-bat had been properly officiated by Wendelstedt, the call was correct. At the time of the ejection, the Royals had won the contest, 4-1. This is Hunter Wendelstedt (21)'s first ejection of the 2016 MLB regular season. Hunter Wendelstedt now has 5 points in the UEFL Standings (1 Previous + 2 MLB + 2 QOCY = 5). Crew Chief Jerry Layne now has 8 points in Crew Division (7 Previous + 1 Correct Call = 8). This is the 51st ejection report of the 2016 regular season. This is the 25th player ejection of 2016. Prior to ejection, Eaton was 1-5 (SO) in the contest. This is Chicago's 4th ejection of 2016, T-1st in the AL Central (CWS, MIN 4; DET 3; KC 1; CLE 0). This is Adam Eaton's first ejection since September 2, 2014 (Greg Gibson; QOC = N [Balls/Strikes]). This is Hunter Wendelstedt's first ejection since August 2, 2015 (Joe Maddon; QOC = U [Replay Review]). Wrap: Kansas City Royals vs. Chicago White Sox, 5/20/16 | Video available via "Read more"